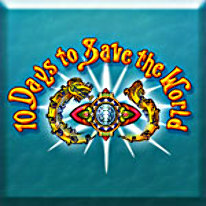 You Have 10 Days to Save the World! 10 Days to Save the World opens two years after Diana and her sister found the mysterious amulet while hunting for artifacts, the Earth starts to experience a string of scary cataclysms, like flooding in Africa, and drought in Venice. Diana has a strange feeling that the amulet has something to do with the disasters, and sets out with her archaeologist father for clues about how she can stop the world from being destroyed.